All that at $110 per person! 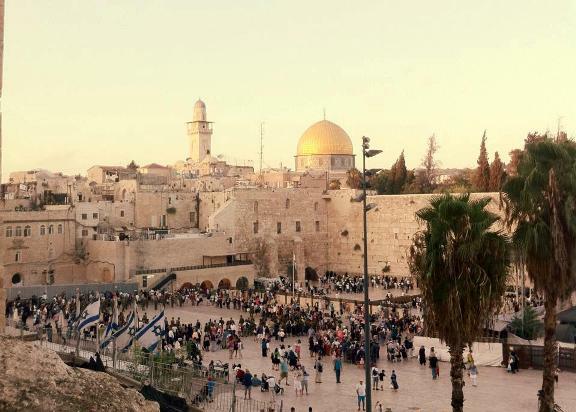 On this most popular Jerusalem Overview tour, you will visit the most important sites to the world's three monotheistic religions: Judaism, Christianity and Islam. In the morning, we'll pick you up at your Tel Aviv hotel. On the drive up to Jerusalem, we'll stop at the Latrun Fortress and enjoy the view from the Trappist Monastery. Our first stop in Jerusalem is the observation platform on the Mount of Olives for a truly breathtaking view. Next stop is Mount Zion, the place of King David's Tomb, the Last Supper Room of Jesus, and Nabi Daud Mosque. All three religions coexist peacefully at the top of Mount Zion. From Mount Zion, we'll drive to Jaffa Gate, the main gate of the Old City of Jerusalem and begin the walking tour of the fabulous Old City. We will visit the Holy Sepulcher Church, the five last stations of the Way of the Cross (Via Dolorosa) including Golgotha, the places of Jesus's crucifixion, his burial and resurrection. We will continue our walk along the old Roman Cardo, and visit the Christian, Jewish and Muslim quarters of the Old City. Descending downhill, we'll enjoy an amazing view of the Temple Mount and the Al Haram Al Sharif mosque. Last stop in the Old City is the Western Wall, the holiest place on earth for Jews. We'll return via Dung Gate to our comfortable minibus and drive back to your Tel Aviv hotel. If you prefer to customize your Jerusalem tour and choose exactly where to go and what to see, why not try a Private Tour of Jerusalem.